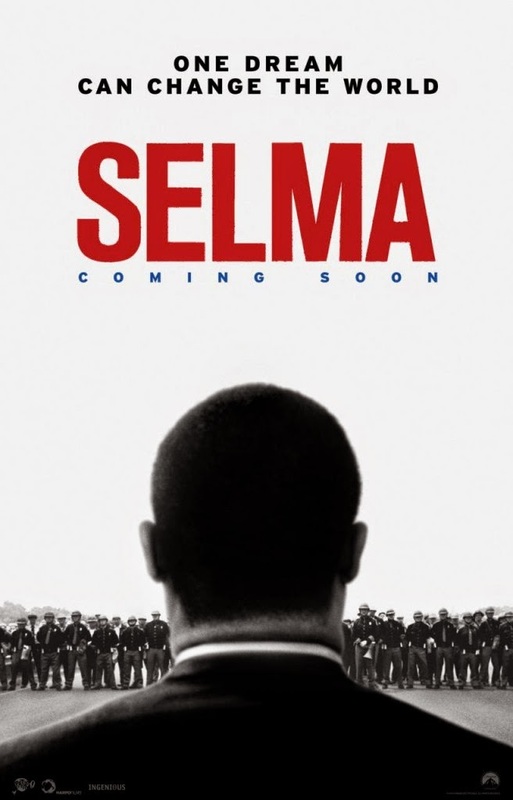 SELMA is a handsomely made, beautifully acted and devastatingly searing movie about the 1965 Voting Rights March from Selma to Montgomery, Alabama. It's also a movie about the difference between having a right in theory and having a right in practice, and as such, is a profoundly important and timely film. What it isn't, and thank goodness for that, is a conventional hagio-biography in the Great Man does Great Things genre. This isn't, and sorry to keep going on about it, as dumb as THE THEORY OF EVERYTHING. The movie opens with Martin Luther King already a major political force. He has the ear of President Johnson and wins the Nobel Peace Prize. But despite the end of segregation by Federal Law, in Governor George Wallace's Alabama, African Americans are still subject to extreme racism. In an elegant, swift and brutal opening triptych we are therefore given King's Nobel acceptance speech; the 16th Street Baptist Church Bombing; and Annie Lee Cooper being denied her application to register to vote on the most spurious and humiliating of grounds. We are told, as President Johnson is told, that this is a key issue because only when African-Americans can vote will they be able to exercise their ability to vote out racist officials and so fully live their lives. And so the battle moves to Selma, Alabama - a town where King can orchestrate a highly publicised racist attack on peaceful demonstrators and so force President Johnson's hand in enacting Federal Law to prevent these spurious obstructions to voter registration. King is presented as a deeply religious man - calling Mahalia Jackson for inspiring hymns in the early hours of the morning - a deeply political man - manipulating the press and the President - and a deeply conflicted man - guilty at being dressed up for the Nobel Prize while his people suffer, guilty when they are violently attacked in attacks that he and the struggle need to continue - guilty for cheating on his wife. I love the fact that screenwriter Paul Webb shows King as conflicted and doubted, that he isn't the sainted leader he can now appear to be. I like that we see the factionalism and envy within the campaign, and also the doubt as to his tactics and motivation. But I'm also pleased that aside from one deeply felt and beautifully acted confrontation, his marital infidelity isn't allowed to overshadow the politics. Because in doing so, we would be falling into the same trap that J Edgar Hoover laid for us, to sully the man, and so the movement. All that conflict shines through David Oyelowo's lead performance - one of power, charisma and humanity. You can feel why people followed this man. But I think in a sense this is a great ensemble piece. Carmen Ejogo has few scenes as Coretta Scott King but transmits her grace, suffering and strength. Oprah Winfrey is magisterial as Annie Lee Cooper. Lorraine Toussaint commands our respect as Amelia Boynton Robinson. But there are so many small and memorable roles that I would simply be listing the entire cast. Perhaps most astonishing, however, is the fact that the three largest roles - King, LBJ and George Wallace are played by British actors with what seemed to me to be perfect accents and intonations without ever seeming like cheap impersonations. Behind the camera I was utterly impressed by Ava Duvernay's direction. The violence is powerfully sound edited and sometimes slowed so that we can feel every injustice. There's a particular scene where we see Annie Lee Cooper fall back unconscious that is almost a camera POV that's very effective. Even when we're aware that she's recreating iconic scenes or newspaper photos, they still feel alive and tense and filled with fear and the possibility of violence. I also loved the conceit of having the FBI's wiretaps and logs of the movement on screen at key moments, piercing the warmth of cinematographer Bradford Young's brown, yellow and green tones. There's a seen early on in SELMA when a grandfather, is mourning his grandson, Jimmy Lee Jackson, who has been shot by a racist cop. He tells Dr King that he is now 82, and that his grandson said he'll one day be able to vote. I started crying at that line and I never stopped. I'm crying right now - proper tears - recalling it. This film made me, as a woman of colour, think deeply about how lucky I am today to be able to vote and live a life relatively unencumbered by racial prejudice. It made me feel the blows of violence more than anything I'd seen before - translating an academic understanding of the civil rights movement into something visceral which is exactly what film should do. It made me wonder whether, having drawn the short straw, I would've had the courage to walk two by two in the front line toward police guaranteed to beat me down. It also made me wonder, today, if there are black kids who feel that certainty of violence in America. And in London right now, if I would have the courage to go miles out of my way and march side by side with the oppressed. Great films do this. They make you feel rather than just know. And they make you question and re-affirm. SELMA is a great film. SELMA has a running time of 128 minutes and is rated PG-13. SELMA was released in the USA last year and opened in January in Brazil and Canada. It opens this weekend in the UK, Ireland, Argentina, Greece and New Zealand. It opens on February 19th in Germany, on March 6th in Sweden and on March 11th in France.